This distinguished looking building with its majestic Spanish architecture sits in the heart of Old Town Goleta. A front park with a gazebo, beautiful trees and a winding brick path give it the feel of a town square. 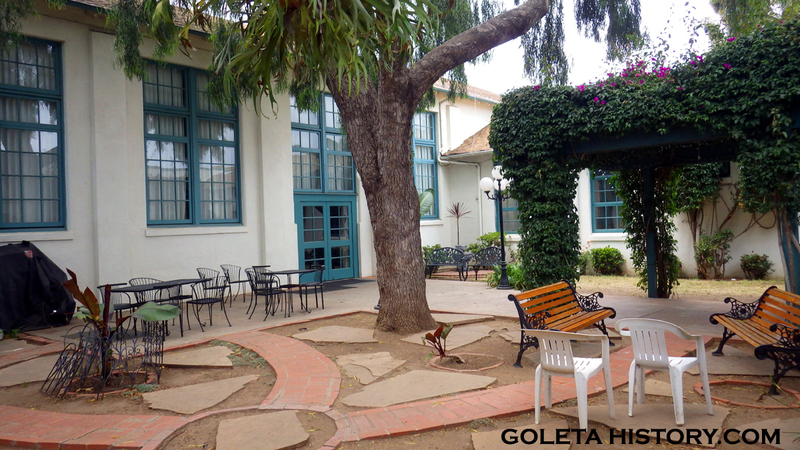 Known today as the Goleta Community Center, every local knows this as the hub of Old Town Goleta. On closer inspection, you’ll notice it was once called the Goleta Union School. 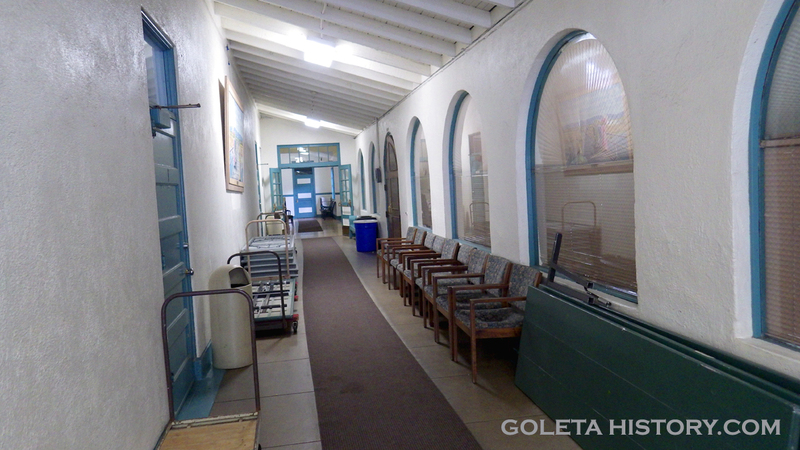 It served as an elementary school for generations of Goleta children, from 1927 to 1976. 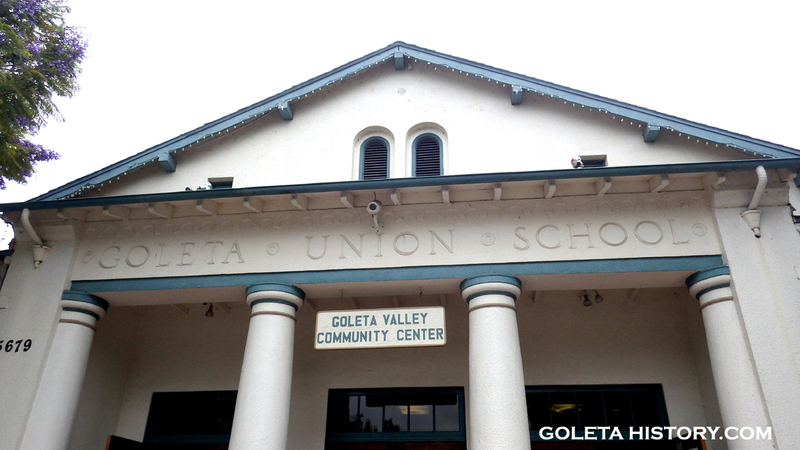 The word Union explains that it was the result of a consolidation of the first three elementary schools in the Goleta Valley; the Goleta School, Cathedral Oaks School and La Patera School. 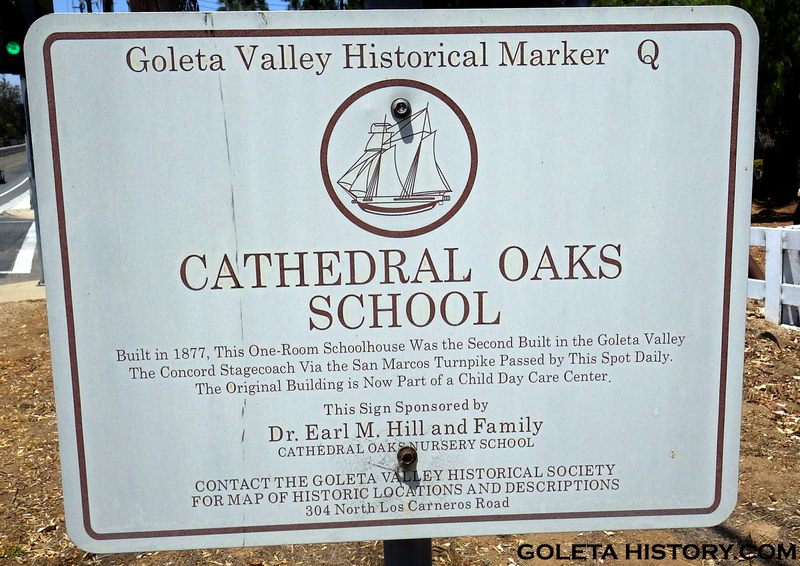 The first school in the valley was the Goleta School. 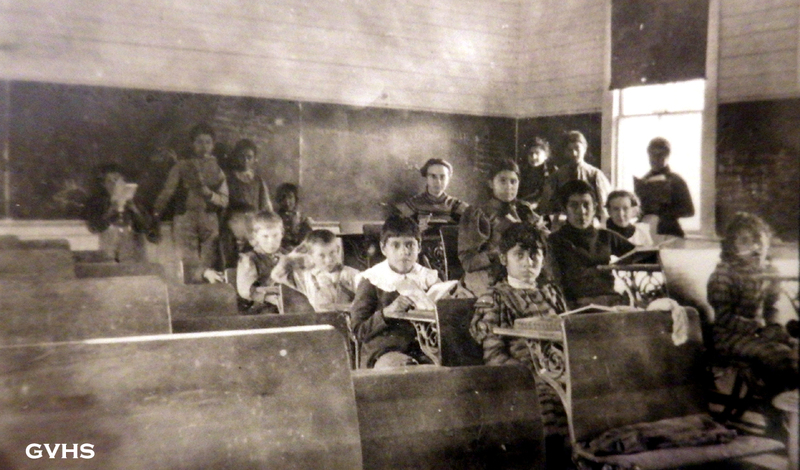 It was originally called the Rafaela School, named for the widow of Daniel Hill. 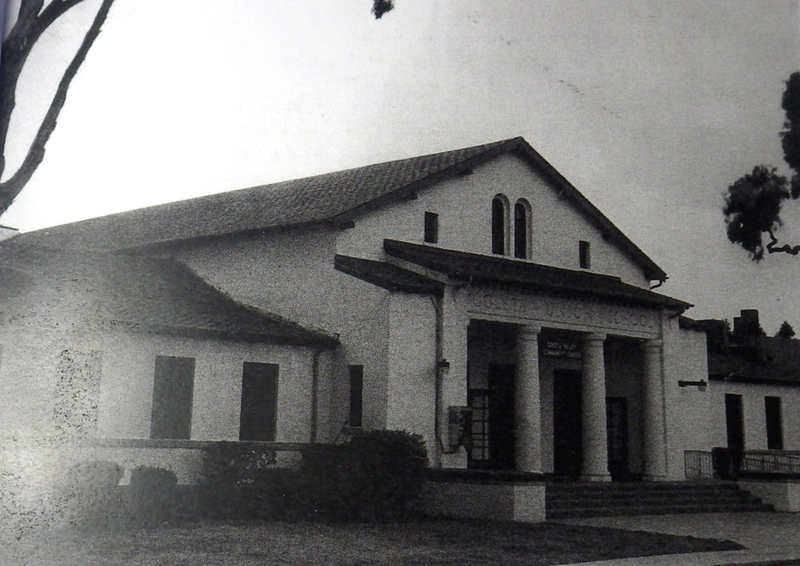 It was located on the south side of Hollister Avenue, across from Chapel Street, where the Goleta Hospital is today. The land was donated by T. Wallace More and the little red schoolhouse was built by volunteers in 1869. It was only 16 X 20 feet in size, but it served eight grades! The students were nicknamed the “Clodhoppers”. Judging by this photo, the Clodhoppers were not to be messed with! Frank Kellogg, a local dairyman, was the teacher here for 14 years. 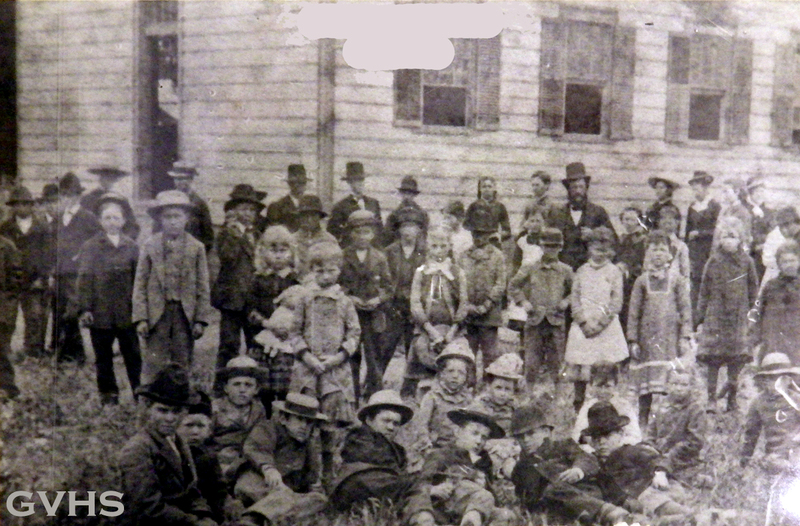 As the population grew, the need for a larger school become apparent, so in 1883 a new two story building was constructed just around the corner on Patterson Avenue. The four lower grades were downstairs…. And the four upper grades were upstairs. The new school was cleverly nicknamed the “Two-Story School”, but the students were still Clodhoppers. 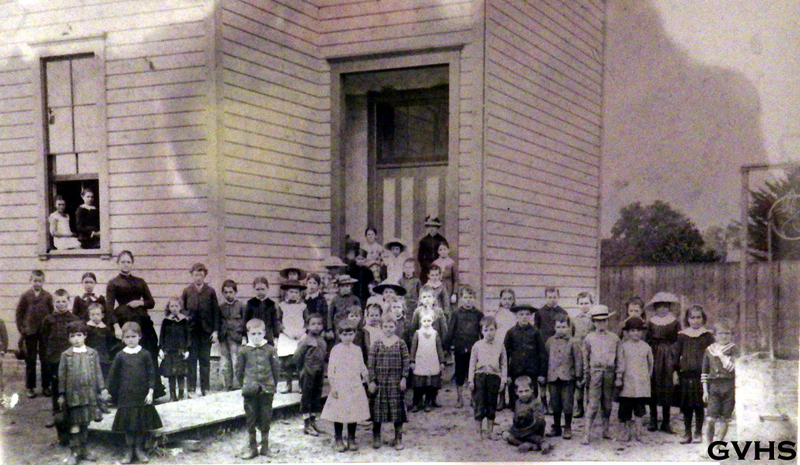 This school served the community well, until 1911, when it was condemned as a fire danger and had to be demolished. It’s fascinating to study these young faces. We’ve all fantasized about living in Goleta back in the good old days, but judging by their expressions, maybe things weren’t so great. Or maybe the photography process was long and painful? To replace the Two-Story School, this beautiful new school was built at the same location. 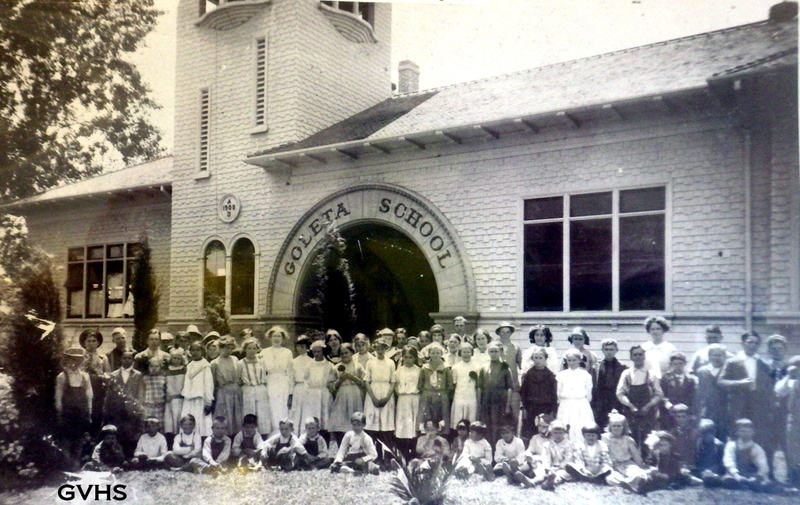 By petition, it was named the Goleta School and it served the community there until 1927. 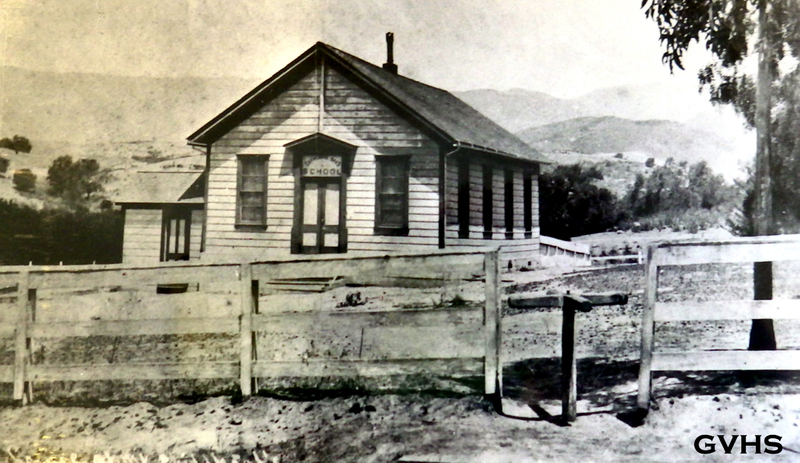 The Two Story School and the Goleta School were both located at 177 South Patterson, which today is where this auto repair shop is located. 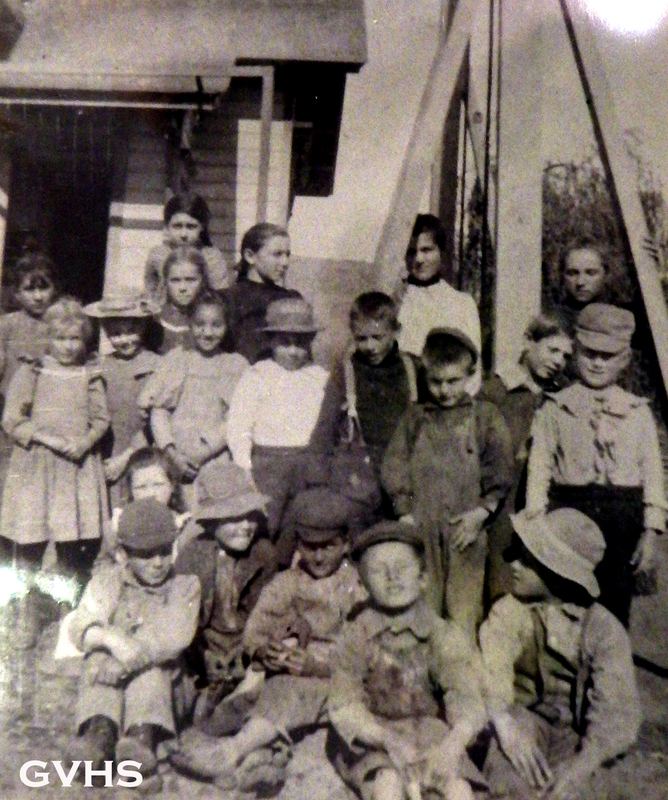 Farmer’s kids living in the foothills couldn’t walk all the way to Rafaela/Goleta School every day, so they started holding classes in a barn on the Maria Ygnacia Ranch in 1874. Concerned parents and residents paid Captain R.P. Tucker $50 for an acre of land and in 1877, they built this one room country school. 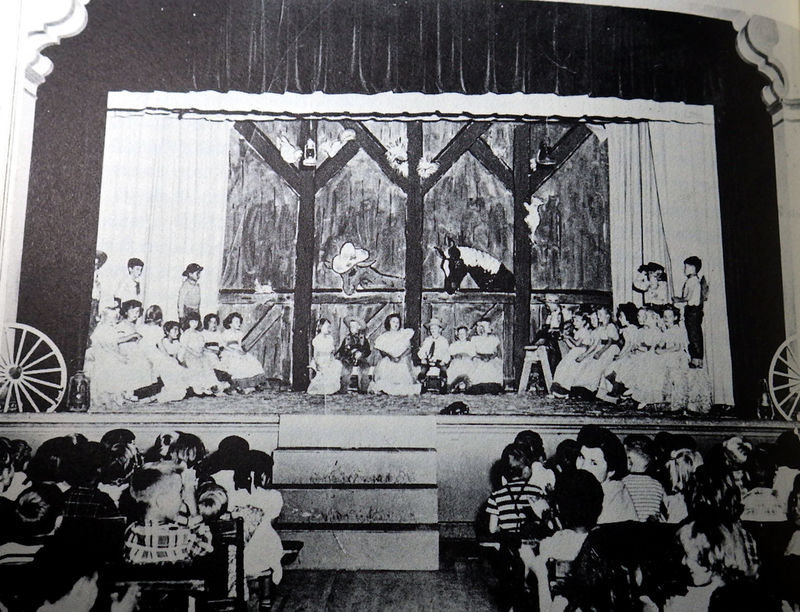 The kids at Cathedral Oaks School were mostly children of ranchers and farmers. 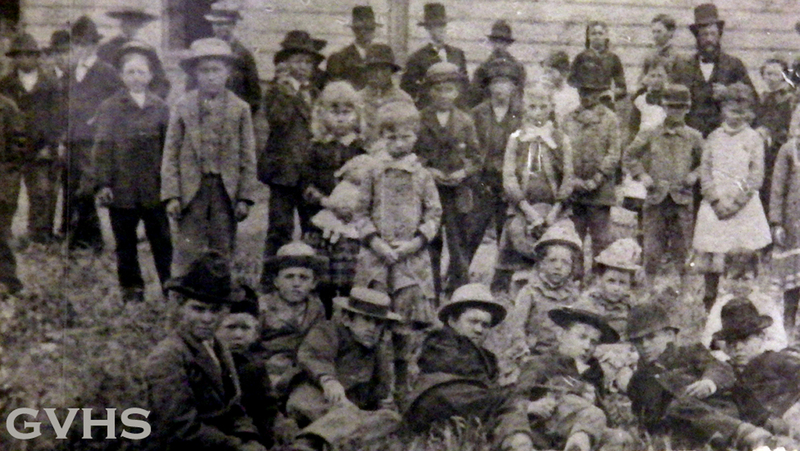 Around this time, a widely circulated photograph had given Goleta national attention for their gigantic pumpkins, so these farm kids were nicknamed the “Punkin-Rollers”. 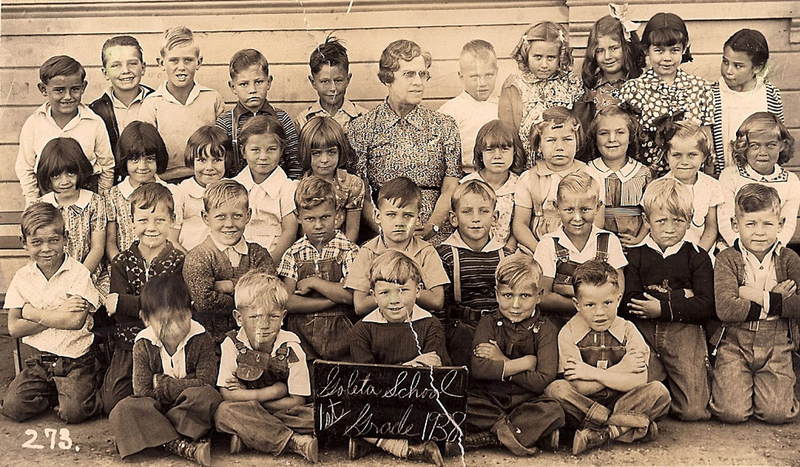 Amazingly, Cathedral Oaks School is still serving Goleta as a nursery school to this day. Its been remodeled and added to, but the original building is still in there. This sign is in front of the building, at the corner of Cathedral Oaks and San Marcos Road, designating its historic value. 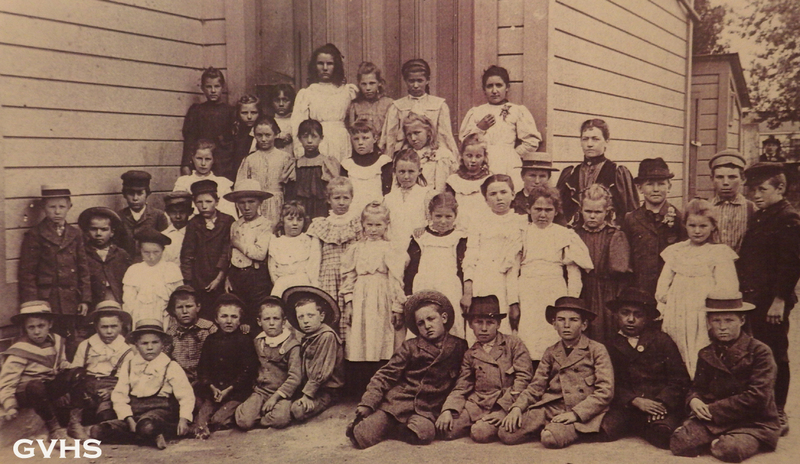 Also in 1877, parents living on the west side of Goleta formed a third school district called La Patera. 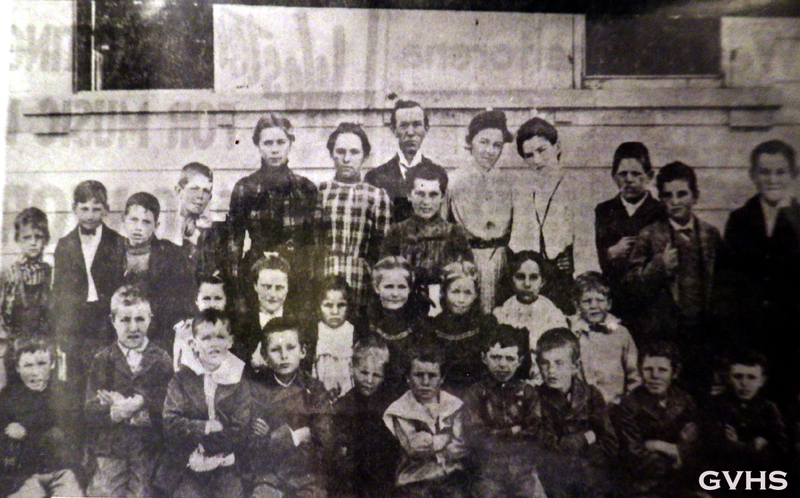 Originally classes were held in an old house just west of Fairview Avenue. 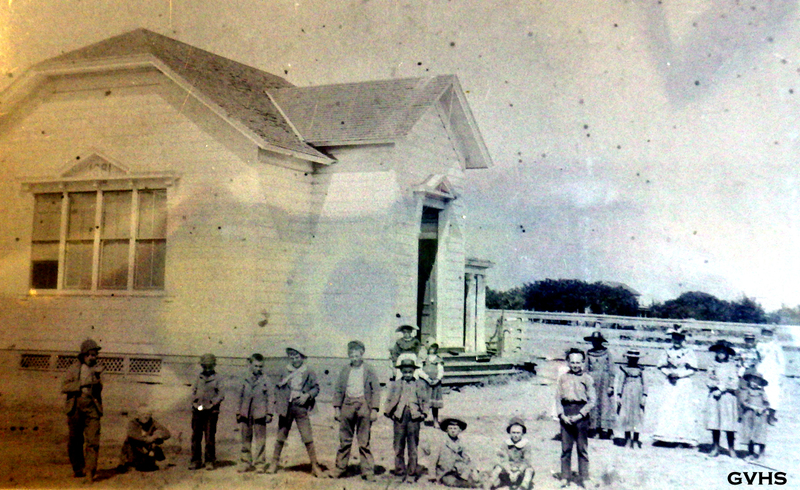 In 1881, a new schoolhouse, shown here, was built further north, on the east side of Fairview Avenue. This is the location today, next door to the Goleta library. 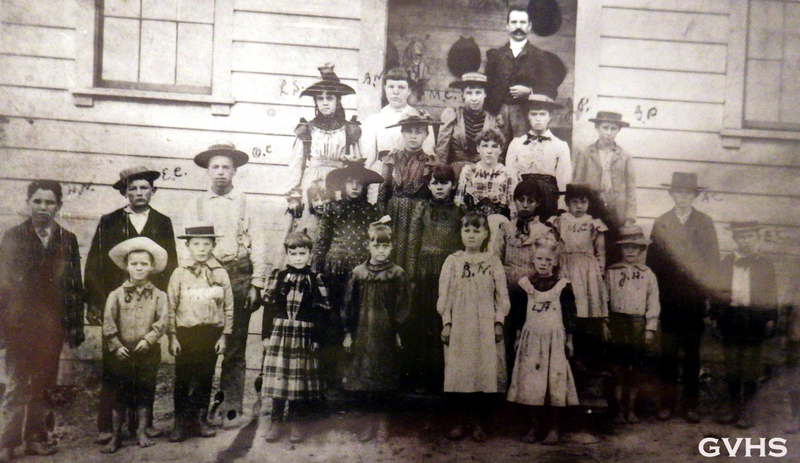 La Patera School was moved again in 1895 to La Patera Lane, just north of today’s railroad. Due to its proximity to the slough and all the waterfowl, La Patera students were called the “Webfoots”. 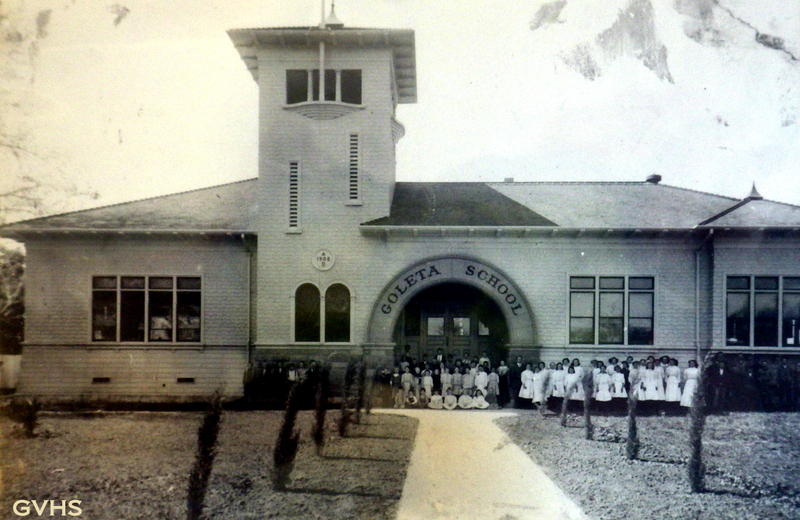 In 1925, the community voted to consolidate these three Goleta Valley schools into one Goleta Union School District. Land was purchased from the Begg family on the south side of Hollister Avenue, just west of San Jose Creek. It had previously been the location two different saloons. A building design by Santa Maria architect Louis N. Crawford was chosen and construction began at the end of 1926. 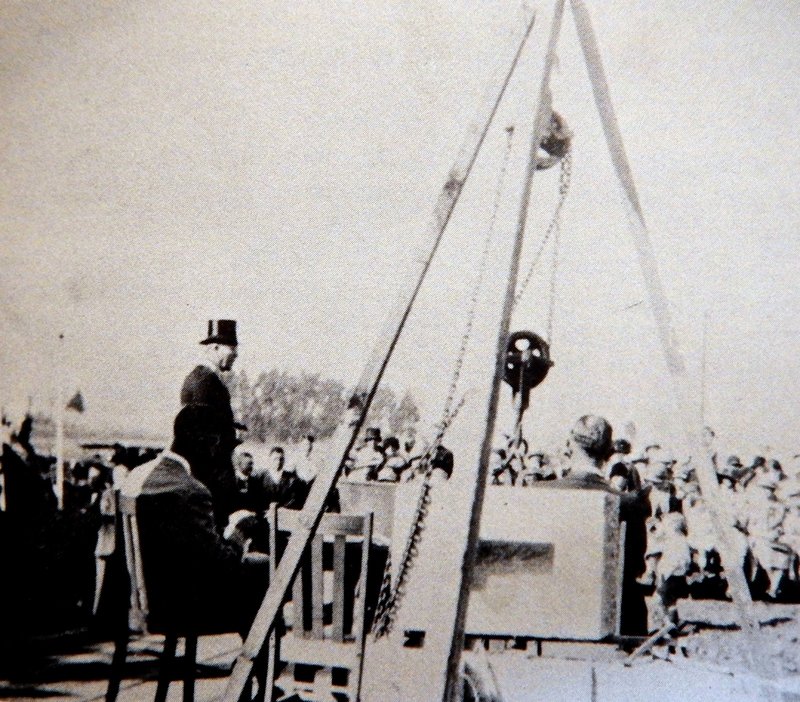 A cornerstone ceremony was held on February 26, 1927, with much pomp and circumstance. 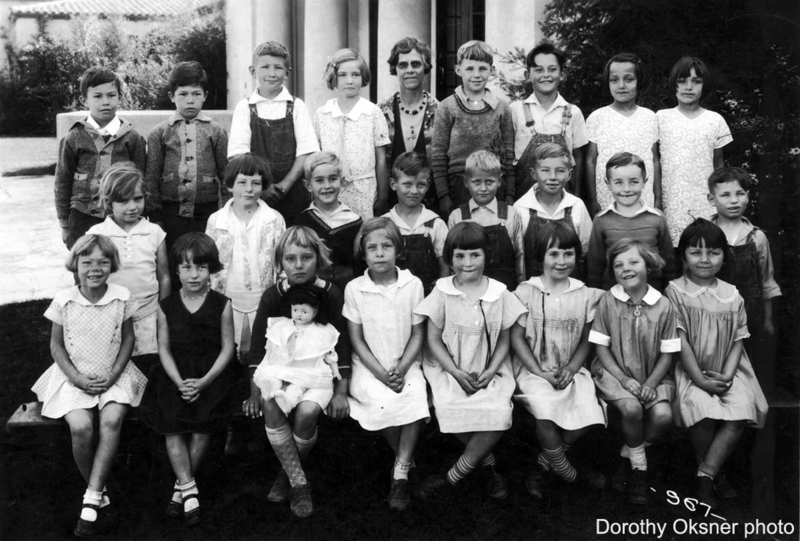 Goleta Union School was ready for students by the Fall of 1927. The impressive new school had eight classrooms, a beautiful auditorium with a stage, offices, a kitchen, a locker room with showers and other modern conveniences. 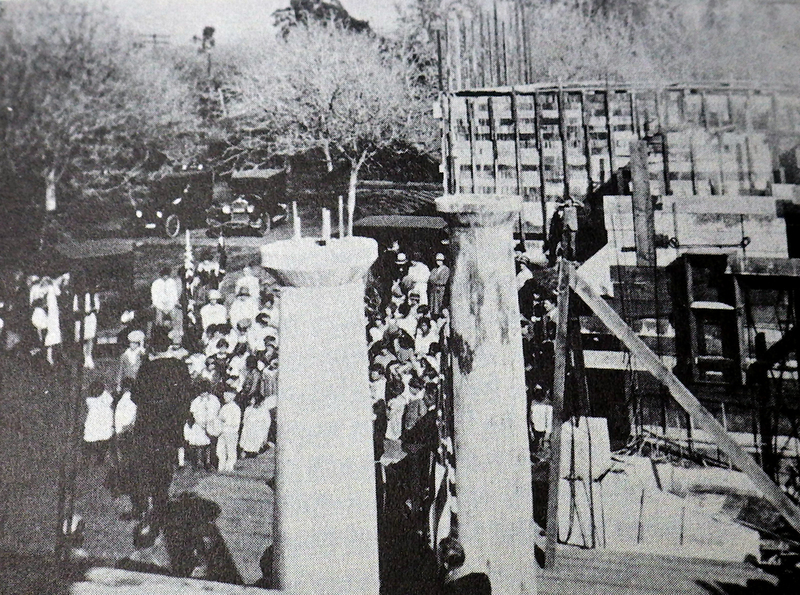 In 1928, the former Goleta School building that was on Patterson Avenue was moved to the back lot of the new school and used as a kindergarten until 1957, when it was demolished. The PTA was very active at the new Goleta Union School, helping to raise funds for important things like stage curtains and soup and sandwich lunches. The students were excited for all the new classes and activities like sewing, cooking, organized sports and performing on a big stage in an auditorium! Most of the Goleta kids were thrilled to go to such a big, beautiful new school, and to have so many more friends to be around. Clodhoppers, Webfoots and Punkin Rollers were all united at last! 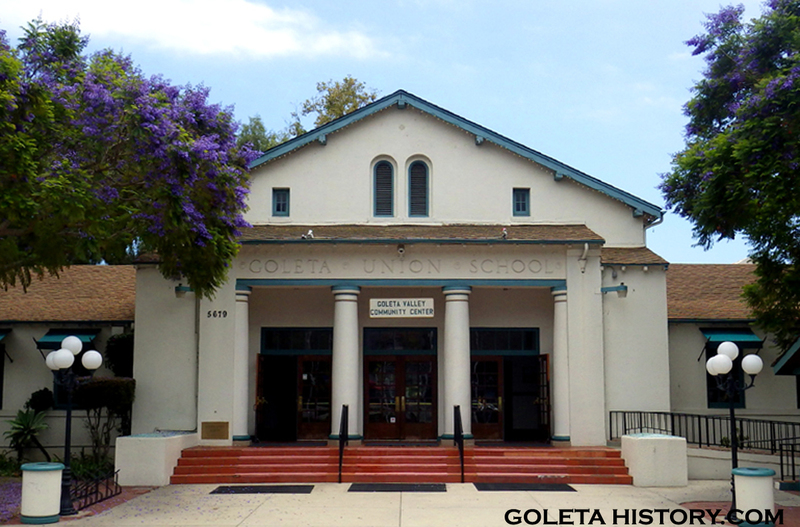 While the Goleta Union School was built primarily to educate the children of Goleta, it also served as Goleta’s first library, a community dance hall, a theater, a refuge for flood victims, a USO facility during World War II and a public meeting place. 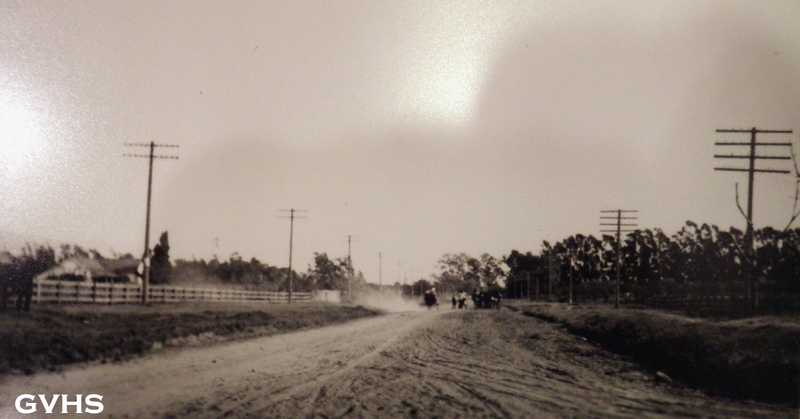 After World War II, the population of Goleta boomed. This created the need for several more new schools to be built around town. 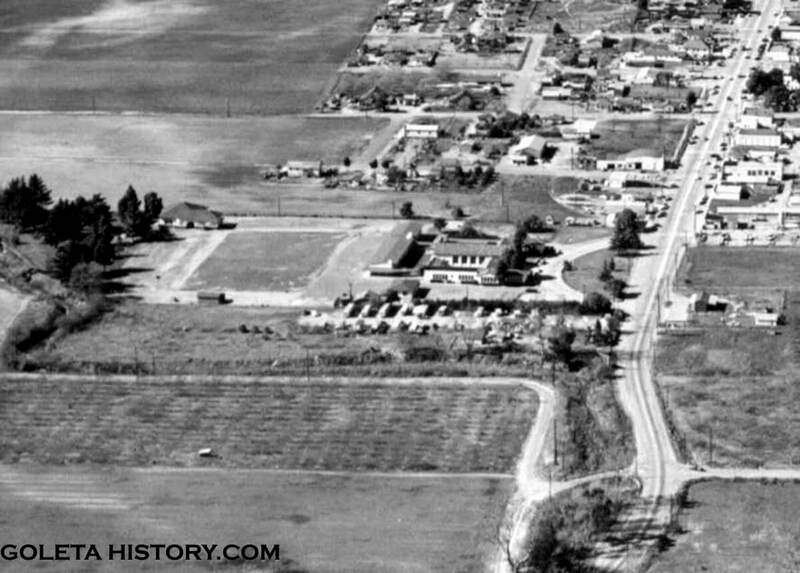 Shown above is downtown Goleta in 1951. 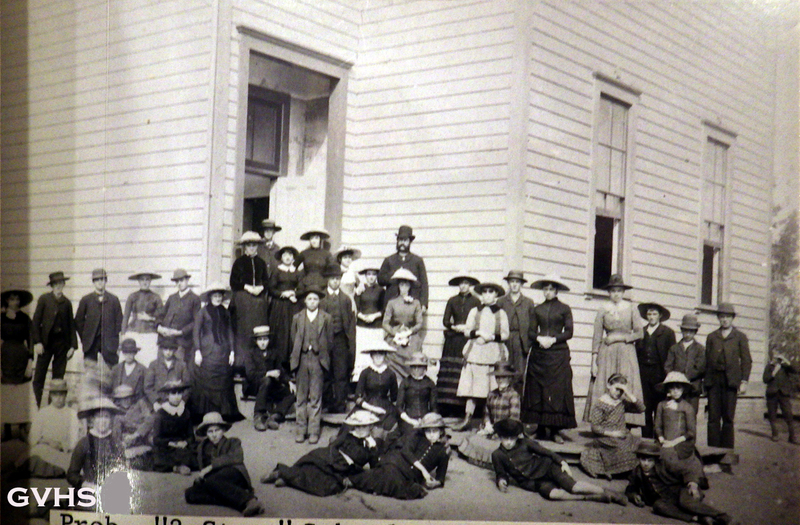 Goleta Union School served thousands of Goleta students over the years. 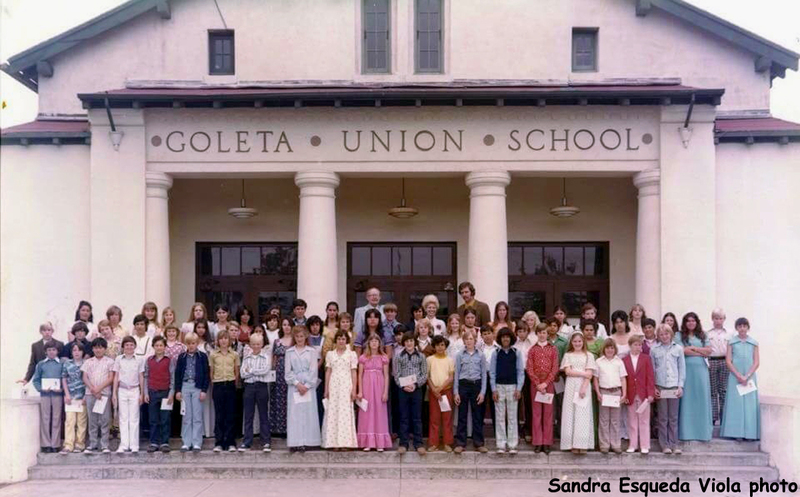 The 1970’s brought a decline in enrollment and several Goleta schools were closed. 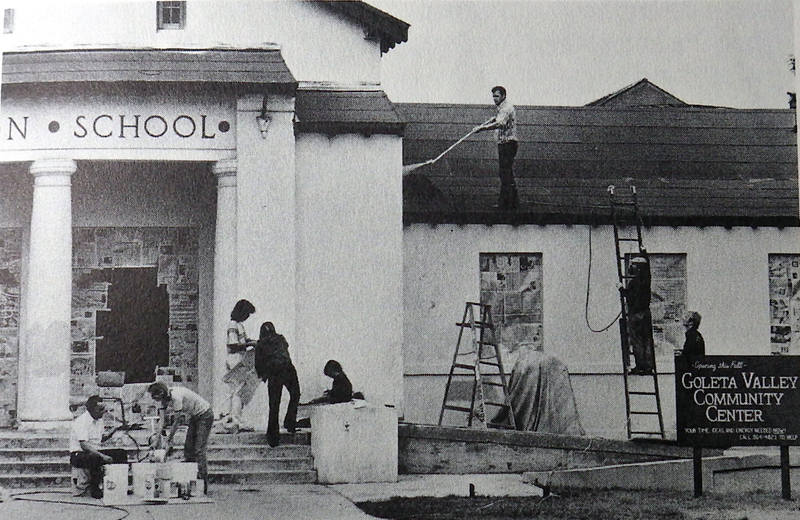 In 1976, the Goleta Union School was closed due to the lack of students and the old building didn’t meet modern earthquake standards. This was the class of ’75, the last year schoolkids posed on these steps. Rather than letting the beautiful structure to be torn down, local activists and two prominent government officials, Jack O’Connell and Bill Wallace, led a drive to save the historic building for use as a Community Center. In 1977, the County signed a 10-year lease with the School District to renovate the property and the Goleta Valley Community Center was born. But there was much work to be done. 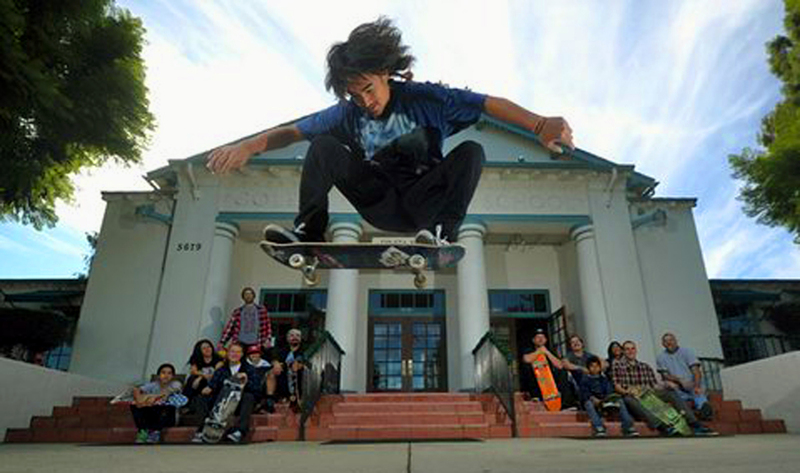 The citizens of Goleta stepped up to save the beloved old school. Volunteer work parties were held and a “Goleta Center Fund” was started, raising money through donations and charitable events. It was truly a community effort, rallying folks together to save a part of their history, and to create a place of value for future generations. 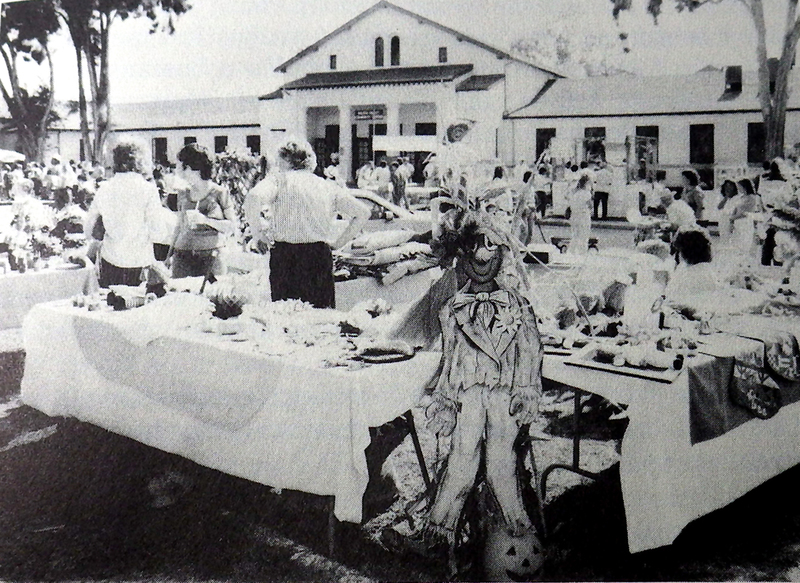 The Goleta Valley Community Center was dedicated in 1978, during the Goleta Valley Days event. Opened on a slim budget, it immediately began to meet local needs with a small, but dedicated staff. The 1980’s brought budget cuts, and it looked like the Goleta Community Center would have to be sold. A commercial development company proposed tearing the old building down to make way for a profitable new shopping center, but once again the citizens of Goleta came to the rescue. 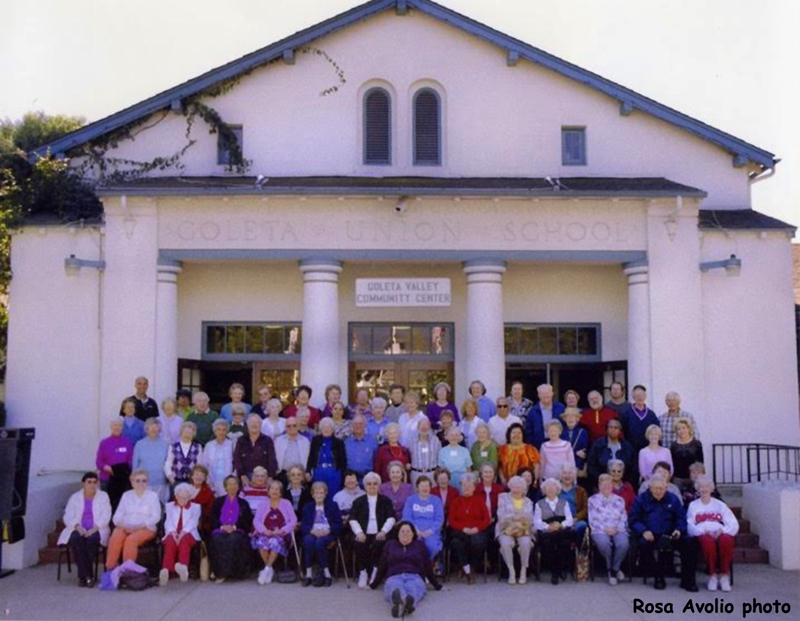 At a well attended public meeting in 1983, the people made it clear that they felt the school building was a “landmark worth saving” and that the center was a “vital Goleta institution”. In 1983, the County saved the day and purchased the property from the school district. 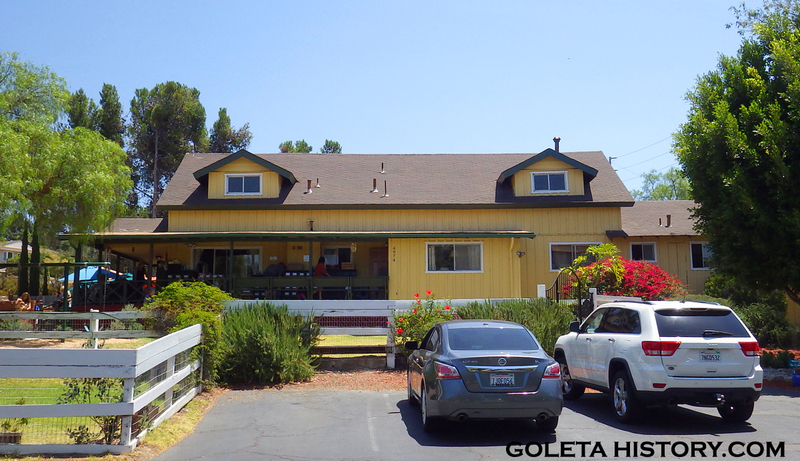 They then leased the property to the Goleta Valley Community Center’s board of directors. They continue their stewardship to this day, continually improving the facility and making the grounds a charming, park-like setting. The Center is the home to the Goleta Valley Senior Center, the Community Action Commission’s Headstart program, three daycare centers, food programs, Legal Aid, dance and karate studios, business seminars, training classes, churches, and much more. Several historic memorial plaques are on site, and annual events are held there, such as a Veteran’s Day celebration, summer concerts and a Christmas tree lighting. It is now, more than ever, the focal point for media gatherings, political meetings and public announcements. 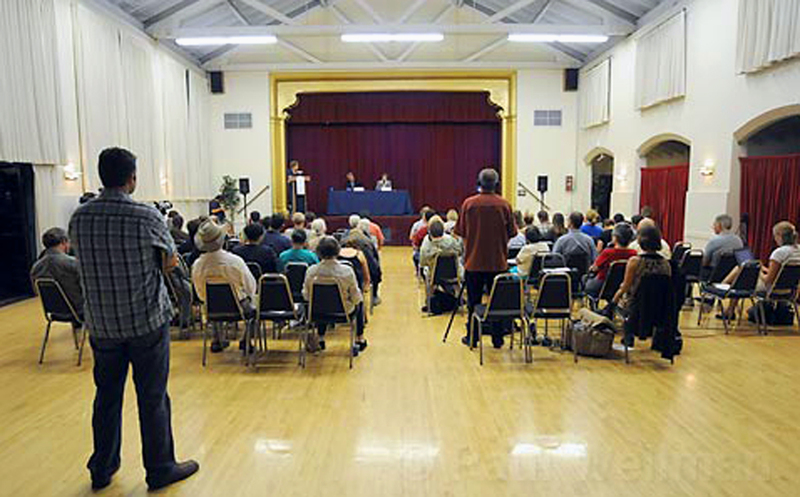 In 2013, the City of Goleta purchased the property. Due to the building’s age, safety issues have demanded City Hall’s attention. Hopefully they can work out a plan that will renovate the old school and keep it functioning as a community center and a town square for Goleta. 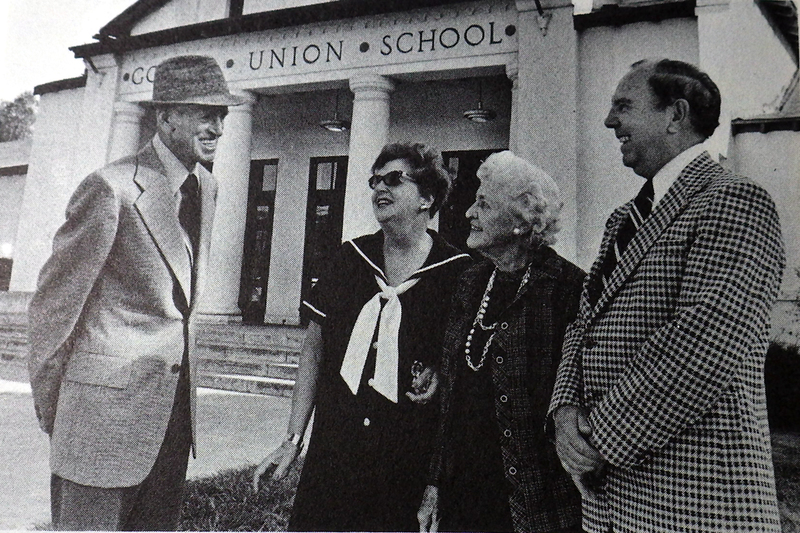 There may be no other building that represents the spirit of Goleta better than the Goleta Union School. Hopefully, it will be preserved as a historic landmark by the city of Goleta and kept open to serve the community, well into the future. Sources: Goleta Valley Historical Society, Walker A. Tompkins, Horace A. Sexton, Gary B. Coombs, Santa Barbara Independent, Stella Haverland Rouse, Santa Barbara News Press, Justin Ruhge, Rosa Avolio, Sandra Esqueda Viola, Dorothy Oksner and special thanks to Lisa Scoggins. Love it! having grown up in Goleta in the 70’s and 80’s I loved reading this history. Goleta will always be in my heart for as long as I live. This is a wonderful project and display of Goleta History for all of the ancestors to share with our relatives still living for the Begg & Main settlors who came to Goleta in the 1885’s, etc. Thank you so much to those who put this together. Much appreciation. As a kid I went thru my school class, I think fourth grade, in 1978 to help with clean up. I remember removing bee hives. It was crazy. What is the origin? Did someone named Brandon once live here?